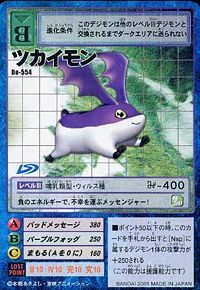 It resembles Patamon in appearance, but its personality is a total opposite. A rather twisted creature, it acts as a familiar for Devimon and others. Having a personality that makes it prone to brawl, it attempts to settle things down with a fight immediately. Its Special Move is making the opponent cry with insults packed with negative energy (Bad Message). 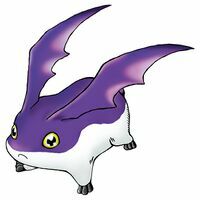 A Mammal Digimon characterized by its big ears. 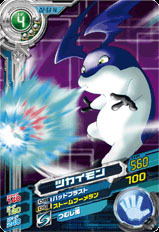 Although it is considered a subspecies of Patamon, it has quite the opposite personality of Patamon, so it loves brawling. Usually, it acts as a familiar for Devimon and others. Its Special Move is making the opponent cry with insults packed with negative energy (Bad Message). From both Tukai (使い) and Tukaima (使い魔), Nihon-shiki romanizations meaning "messenger" and "familiar spirit" respectively. Surrounds the opponent with a dark fog. 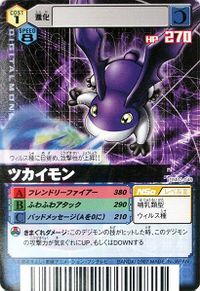 バッドメッセージ Baddo Messēji Evil Spell/Purple Fog Makes the opponent cry with insults and negative energy. Shoots fireballs at friend or foe. Fuwafuwa Attack  Fluffy Attack ふわふわアタック Fuwafuwa Atakku Fluffy Attack Tackles the enemy. Surrounds the opponent with a dark smog. 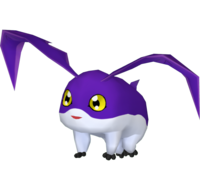 Tukaimon is an enemy Digimon. It can usually be found at night. 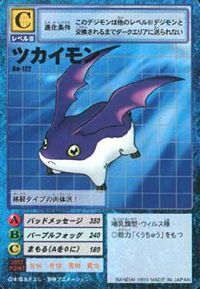 Tukaimon is an obtainable Digimon. 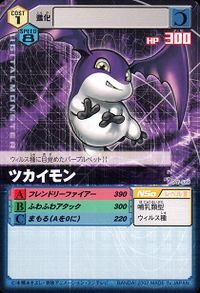 Can evolve to Bakemon (0-2 DP) or Soulmon (3+ DP). 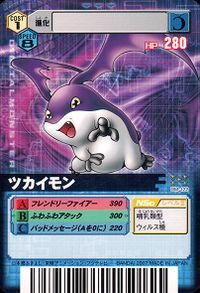 Tukaimon appears as an obtainable Black Card. 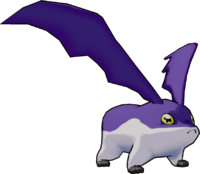 Tukaimon can be evolved from Pagumon. 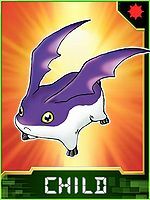 Tukaimon is available as a Digimon Medal. A combat-type Digimon who loves to brawl! A messenger who carries bad luck with its negative energy! A purple pet who has awoken as a Virus attribute!! A brawler that unleashes fierce attacks, contrary to its cute appearance! The Virus Attribute has awakened within it, increasing its aggressiveness!! A Digimon that appears to be a subspecies of Patamon. 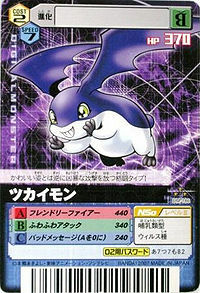 Its rebellious personality is the exact opposite of Patamon's, and it loves fights. This page was last modified on 14 April 2019, at 00:58.